Lock in a great price for Grandhotel Pupp – rated 8.9 by recent guests! We celebrated our anniversary in the Grandhotel Pupp and while we definitely enjoyed our experience (the spa was lovely and our bed was very comfortable), it didn't feel entirely 5-star to us. Nice hotel and location. We did a thai massage in the sensai spa of hotel pupp. Really worth it! The whole hotel was lovely, since we like old fashioned, it absolutely matched our expectations. The breakfast in contrast to the dinner was excellent every single day. The food was good. The room service was very prompt. The location is really centrally located to all of the shops and spas. The food was excellent, I enjoyed the spa treatments and the pool area was very inviting. Beautiful and historic building in a perfect location. Lovely hotel, and if you are a 007 fan you MUST stay here. Although my friend and I went during the off season, and not everything in the hotel was open, it was still nice. Had a balcony that had a lovely view of the stream. Everything you would expect from a lux-spa hotel experience. They offered more than my country soul wanted, but everything we did take part in was lovely. One of the most comfortable beds I've had in Europe. Much fancier place than I'm used to, but the staff made me feel welcome and I'm super glad we went. And as a bonus, the hotel is right in the thick of all the are has to offer. Grandhotel Pupp This rating is a reflection of how the property compares to the industry standard when it comes to price, facilities and services available. It's based on a self-evaluation by the property. Use this rating to help choose your stay! 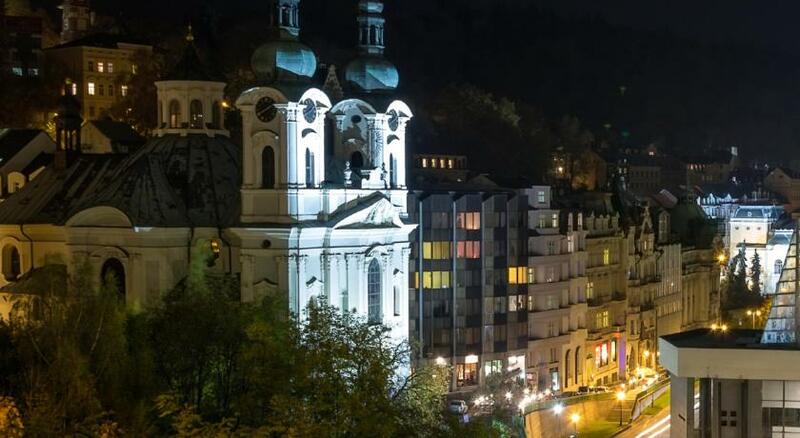 One of our top picks in Karlovy Vary.Grandhotel Pupp is an impressive hotel with a tradition dating back to 1701, located in the historical center of Karlovy Vary, 1,000 feet from the spa colonnade. It offers spacious rooms and suites, a restaurant and exclusive spa center with medical facilities with a relaxing pool, a meditation spa, a dry and steam sauna, a salt cave and a gym. The spa offers over 30 different procedures from beautifying to physiotherapy. Rooms in Grand Hotel Pupp feature traditional interiors with ceiling frescoes and crystal chandeliers. Rooms are equipped with a flat-screen TV and some have a balcony and views of the Tepla River and the Colonnade. Czech specialties and international cuisine are served in the hotel's restaurants. At Café Pupp and on the summer terrace, guests can enjoy traditional desserts and desserts. One of the restaurants, Becher's Bar and Little Dvorana, has evening entertainment, including live bands. Grandhotel Pupp was founded in 1701 by Johann Georg Pupp, an original confectioner. The hotel was home to famous celebrities such as Johann Wolfgang von Goethe, Johann Sebastian Bach, or Richard Wagner. When would you like to stay at Grandhotel Pupp? It comes with a bathroom with a bath and/or shower and toilet. This room features access to the wellness center. Please note that the room rate is based on 2 guests. Maximum occupancy is 3 guests (see Property Policies). This room features either views of the river or park, and comes with a bathroom with a shower and toilet. A 2-room suite with a bedroom and living room, featuring views of the river and town. There is a marble bathroom with a bath, shower and toilet. Almost all Premier Suites have air conditioning. This suite features access to the wellness center. Room with attached bathroom with a mini-bar, satellite TV and Pay TV channels. The room features views of the park or forest and has its own reception. This junior Suite offers a large separate bedroom with adjoining living area, a luxuriously equipped bathroom with bath and / or shower and toilet. The suite features access to the wellness center. This apartment comes with a bedroom, living room, stucco-work decorated ceilings, and a marble bathroom with a bath, shower and toilet. The apartment features access to the wellness center. This suite has a balcony, sofa and mini-bar. This double room features a patio, mini-bar and seating area. House Rules Grandhotel Pupp takes special requests – add in the next step! Grandhotel Pupp accepts these cards and reserves the right to temporarily hold an amount prior to arrival. Please note that the dress code of the hotel is smart casual. Entry to the wellness center for children up to 14 years accompanied by parents possible between 11:00 and 15:00 daily. The entrance to the pool is possible only with the swimsuit according to the European standard. When booking more than 3 rooms, different policies and additional supplements may apply. Hotel may contact you with more information. The room rate applies for max. 2 people in 1 room. The services for a child or a person on extra bed should be purchased individually. Please inform Grandhotel Pupp of your expected arrival time in advance. You can use the Special Requests box when booking, or contact the property directly using the contact details in your confirmation. The associated casino - still required you to take Identification even though a guest at the hotel. Breakfast is plenty but relatively low-quality. Concentrated juice, cheap cheese+deli selection and low-grade machine coffee. The breakfast room is gorgeous though and you almost forget the negative aspects when looking around. Amazing historical hotel with a beautiful view of the main river in KV. The hotel itself is an experience on its own. Very well maintained and comfortable. The spa area was also quite nice. Honestly, the service was very subpar. We weren't sure if it was off-season or not, but the staff seemed quite inexperienced and often times, a little rude. Also, the bathroom hairdryers need a major improvement! I should have brought my own from home. When we visited Becher's Bar, it was beautifully decorated but once again, the staff was a little standoffish which felt off-putting, considering we were hotel guests. - the Restaurant has a poor vegetarian offer, I decided to eat outside - better bring your own blow dryer: the rooms are equipped with that horrible "Valera" one that is common in so many hotels in Europe. The staff was awfull! Not friendly at all! All kinds of food and beverages were soo poor! Actually did not expect from this hotel to perform that bad! The comfort of the rooms. Bathroom facilities. Nice Spa. Fresh juice not included in the buffet. U pay 8euros per cup and parking should be free for hotel guests. We paid 15 euros for one night. Beautiful property with absolutely lovely and caring staff. If you're looking for a full blown classic Eastern European hospitality experience with all the attention to the details, absolutely go here. No dedicated internal smoking area other than bedroom which wasn’t offered on check-in, when we asked where can you smoke the receptionist pointed to the entrance door. Superior bedroom room with very poor view to back of hotel. Bathroom was looking tired, no shower curtain in bath so couldn’t shower comfortably with water covering floor area, toilet small and low to sit on. Large hotel with good dining facilities, bar areas very pleasant, adequate seating in all areas, service was good with plenty of staff on duty. Spa massage was excellent, didn’t get any benefit from salt cave.